Some background is in order. First off though, I’d like to stress that I am neither a neuromarketeer, nor a psychologist. I like to play video games, but I don’t design or implement them. I am clearly not an expert. That said, let’s continue. Neuromarketing is a new branch of marketing, where neuroscience is used to try and sell things. This may sound innocuous at first. However, consider that this field uses EEG scanners and eye-tracking to try and find subconscious triggers in human beings that they can use to make people spend money on things. Then the link to video games. You might play video games regularly and not know about loot boxes and the like. Before continuing, let’s have a look at some video game monetization tactics. It all started long ago, when the video game industry introduced the expansion pack to video games. To me Tales of the Sword Coast springs to mind first; an expansion for the original Baldur’s Gate. The idea is a lot older though, it drifted over from board games to video games some time during the eighties. Fast forward to the mid-noughties. With the release of internet-connected consoles, the expansion packs took off, and were redubbed Downloadable Content, abbreviated to DLC. Some started to abuse the idea. Instead of adding content, companies started carving games up, and only sold the barest game at full price, with the rest divvied up in the form of paid DLC. One example is the video game Batman: Arkham City where the missions involving Cat Woman were taken out of the main game and sold as separate content. Why get paid for a game once, when you can get paid twice? When mobile gaming and free-to-play games took off, companies developed a new business model for monetizing video games. The idea of micro transactions is to have a player get the core game for free, but to pay a small amount of money to unlock more parts of it. In MOBA games, for example, a lot of playable characters can only be unlocked by paying for them. In mobile games, you might have to wait days before you can continue to a new level, or you have to pay some money. This payment scheme made its way from free games into the rest of the video game scene. This has led to video games where you first have to pay full price, after which you have a bare bones experience, and are expected to dish out more money for the full experience. Dead Space 3 took this to the extreme, and more a delivery mechanism for micro transactions than a good game. The newest iteration in monetization of video games is the loot box. The idea has been around for a while, but it stepped into the limelight with the release of Overwatch. In this game you don’t buy characters or weapons. No, you buy ‘loot boxes’. This is quite literally a computerized box, from which extra player clothing springs, or catch phrases that you have your characters say in game. The game starts with some easy to get loot boxes, but as you progress, they become scarce. If you want to unlock all the character looks, voices, and whatnot, you’ll have to pay. It adds a layer of games-of-chance to the idea of microtransactions. And that is on top of buying the game itself. It has made the creators of Overwatch (and other game publishers) millions. As stated, neuromarketing uses EEG scanners, eye tracking, and other tools from neuro science to look at marketing. 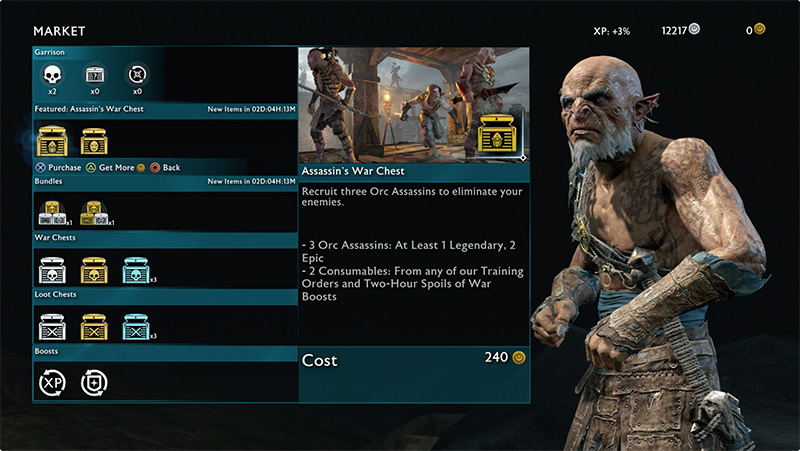 Let’s have a look at some real-world examples from the new Middle Earth: Shadows of War (a game widely criticized for its use of microtransactions and loot boxes). Below is a screenshot of the game’s marketplace. One of the first I learned from the neuromarketing presentation I attended, is that we humans like to look at other people (especially babies), and follow what they are looking at. And lo and behold, what do we see in the screenshot: a humanoid figure who is looking at the things you might want to buy. Next up: when you see a real-world currency symbol (like a $ or €), this triggers a responsive in the pain center of the brain – sorry, I can only find a like to partially corroborate this. And see, no real currency symbol in the screenshot. Oh, and no decimal separators or thousand separators either. Third up, another clever trick. There’s silver coins and gold coins in the Shadows of War marketplace. Doesn’t that 240 gold coins look like a small amount compared to the 12217 silver coins in your wallet? Oh wait, but you only have 0 gold coins. You see, the mind doesn’t interpret numbers based on intrinsic value. It can be tricked, using a thing called anchoring. Showing a large number will make the brain think of the 240 as being a low number. Then there’s the allure of time-limited offers, like the ‘featured’ items in the screenshot above. Yep, that triggers a response. Oh, and I wouldn’t be surprised if the color scheme was tested against some people with EEG scanners. You think this is all just a coincidence? Think again. Video game companies are actively hiring psychologists to ‘achieve their goals’. In most cases, that goal is not to create a rewarding game, or making social commentary, or meaningful art. No, the goal is making shitloads of money. Companies want to make money off their product isn’t a bad thing, is it? Well, there are three reasons that this is in fact a problem. First, these techniques approach (or are) those used in gambling. Taking a look at Wikipedia, there is experimental evidence that winning at gambling triggers an effect in the brain similar to that of cocaine. Basically, the reward-punishment cycle is what drives the addiction. I don’t know how well this maps to video games, but they are built around something called reward escalation. And the fact that neuromarketing proposes to use gamification as a way to drive up sales should tell us something. Secondly, a large part of the video game audience is children. That’s one of the reasons that the dutch gambling authority is investigating loot boxes. Children’s brains don’t work like adults. The neuromarketing tricks have more and different effects on them than may have been intended. Children are more prone to things like addiction, and have a harder time recognizing marketing tricks. I dislike the ‘think of the children’ argument, but the evidence seems to say that video game publishers are pushing mechanisms on children that work like cocaine. And it’s not just children. Other vulnerable groups are also at risk. Thirdly, the games themselves actually suffer. The length and tediousness of games has grown alongside the DLC, microtransactions, and loot boxes. That’s not an accident. People suffer from loss aversion, meaning they don’t want to miss out. They also like to avoid pain. So, games drag users in using reward escalation, then when they’ve formed a habit, want to finish the game but don’t want the slog of continuing, you offer them a way out. They’re primed to want to buy a shortcut; first using in-game currency that they earned, then with in-game currency that they bought using real currency. I’m not a fan of neuromarketing. A field of study aimed at making humans buy things they might not need or want just sounds wrong. When it affects one of my favorite pass times and could put my daughter at risk, I’m worried. Knowing about it is the first step in managing the problem, of course. And I’ve managed to spend no money of my own on microtransactions or loot boxes so far. However, it might be good if the government stepped in. It’s there to protect us from predatory behavior, isn’t it.